On the Map™ is an exclusive and FREE Total Truck Centers™ service that gets local retailers and installers of aftermarket truck accessories listed on the online dealer locators of the manufacturers they sell. 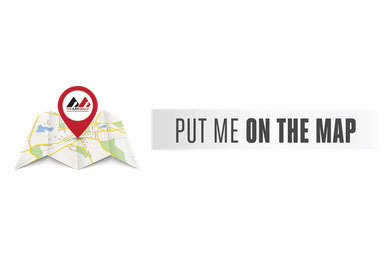 With many consumers researching products online, but preferring to buy locally, On the Map™ helps to direct consumers to their local source for aftermarket products and services: you! The best part is that you don’t have to spend time going to every single vendor website and submitting your information over and over again. The On the Map™ portal sends the same request to every manufacturer you select—saving you valuable time you’d rather be spending running your business. 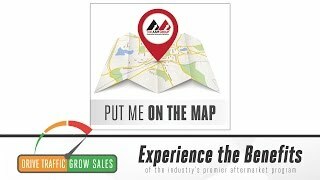 Here’s how it works: visit theaamgroup.com/on-the-map, indicate the brands you actively sell or install, answer a few questions about your business, and click Submit. Within 4–6 weeks, you can expect to be listed on those dealer locators. Note: Please select only those vendors you actively sell, as selecting all of them might flag the request for additional verification and slow down the process. Tells consumers searching for the products you sell that they have a local option. Drive traffic and grow sales. Saves you time by submitting your request to multiple manufacturers at once. Come inside the Total Truck Centers™ garage as we take you through the installation of some of today’s hottest truck accessories In this episode, we install the Baja Guard from Luverne on a 2017 Toyota Tacoma. Want to check out more about Luverne Truck Equipment? 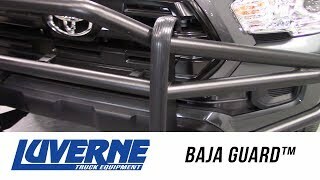 <p>Come inside the Total Truck Centers&#x2122; garage as we take you through the installation of some of today&#8217;s hottest truck accessories In this episode, we install the Baja Guard from Luverne on a 2017 Toyota Tacoma. We’re Off to the Truck Races at Bristol! 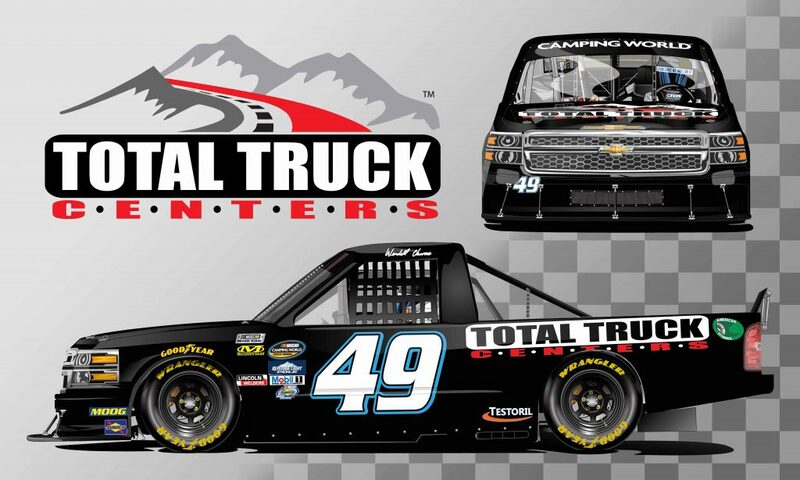 Total Truck Centers™ is excited to announce our sponsorship of Wendell Chavous’s #49 truck in the UNOH 200 NASCAR Camping World Series race, to be held next month at Bristol Motor Speedway in Bristol, Tenn.! In addition to putting the Total Truck Centers™ logo on the hood, back, and sides of Chavous’s Premium Motorsports black Chevrolet Silverado, his image will be used in many of our promotional marketing materials for the coming year. This partnership addresses our distributors’ desire to get the Total Truck Centers™ brand in front of a wider audience: in this case an exciting, nationally televised NASCAR event at one of the sport’s premier venues. We’re inviting all of our Total Truck Centers™ warehouse employees, retailers, and installers to tune in at 8:30 p.m. on Wednesday, August 16 on Fox Sports 1 (FS1) to wave on Wendell as he continues his quest to secure the 2017 Truck Series Rookie of the Year title against all comers. Or if you’ll be in the area, come and take in the race with us! You can also get in on the action by Liking the Total Truck Centers™ Facebook page for updates and by using the #Totaltruck49 hashtag in your own social media to share the experience with your customers! 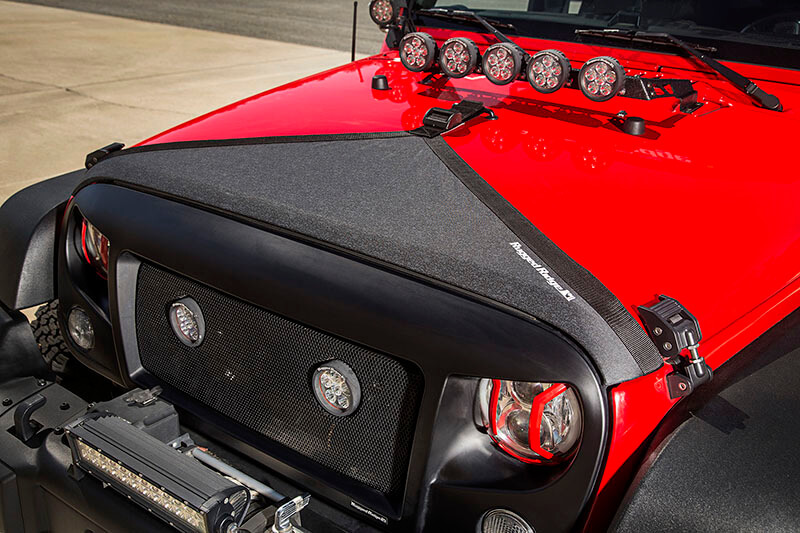 If you want to protect your Jeep Wrangler’s hood from bugs, rocks, and other damaging debris, the new hood bra from Rugged Ridge is up to the task. It’s constructed from durable crush grain vinyl, which offers an added layer of protection where it’s needed most. With its one-piece design and footman hood loop, the hood bra goes on fast and easy—plus, the pillow-soft inner lining shields your paint from scuffs and scratches while simultaneously protecting the vehicle from external debris. This Rugged Ridge hood bra will not interfere with factory or aftermarket hood catches and can be removed quickly and stored easily when not in use. For 2007–2017 Jeep Wrangler JK/JKU. Fabricated from crush grain vinyl with soft, non-damaging backing. Protects hood from damaging road debris and bugs. Won’t interfere with factory or aftermarket hood catches. With four unique styles (Thrasher, Convict, Grenade, and Carnage) and eight colors (Billet Silver, Granite Crystal, Bright Silver, Flame Red, Firecracker Red, Black, Hydro Blue, and Bright White), the NightHawk replacement grille for Jeep from UnderCover has something to fit your unique style. Instantly elevating the appearance of your Jeep, NightHawk replacement grilles go on using the factory grille holes for a quick and easy installation in under half an hour. Built from high-density ABS, NightHawk Jeep grilles are trail tested and road proven. Textured black or painted to match. Easy, no-drill installation using existing holes. Warranty: lifetime on paint and structure. 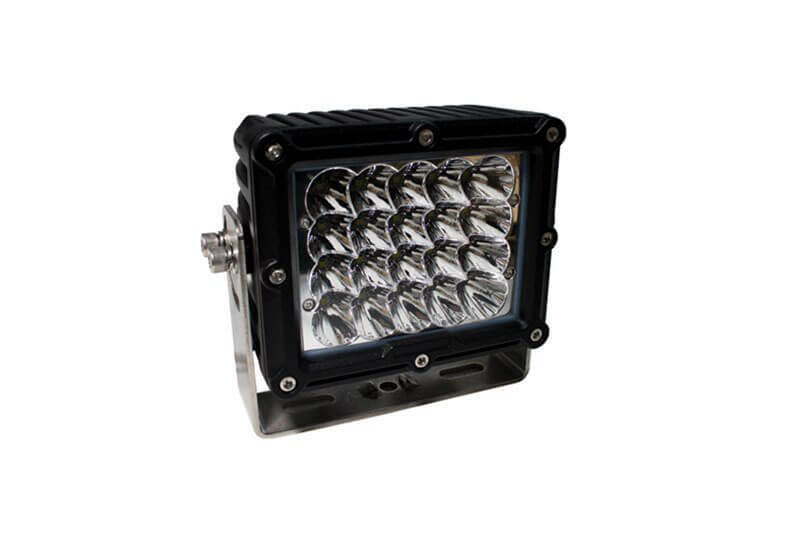 The Ultra Series LED spotlight from Race Sport is practically indestructible, able to withstand everything you can throw at it thanks to its durable polycarbonate lens and IP68 waterproof rating while putting out an astonishing amount of light over 50,000 hours. 100 watts (twenty 5-watt emitters). 10–30 volt DC and 7,000 lumens. Dimensions: 6.25” x 4.25” x 5”. The all-new Terrain HX Extreme Step 3” nerf bars from LUND deliver the ultimate combination of style and functionality, whether you’re running the asphalt or taming the wild. 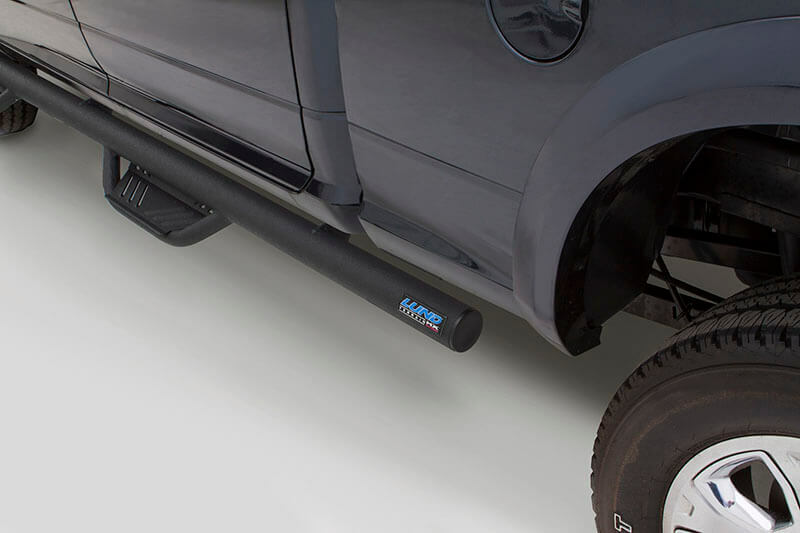 Because road debris and trail hazards can wreak havoc on the finish of your nerf bars, Terrain HX Extreme Steps use genuine Rhino Linings coating to provide an extra layer of protection from corrosion and abrasion. 4” non-skid hoop style steps for easy cab access. Extra rocker panel and door protection keeps your vehicle looking newer longer. Invented, engineered, and manufactured in America. AAM File Center™ is a custom tool built just for Total Truck Centers™ jobbers and warehouse distributors. It can be accessed through the Insight™ account system or the Total Truck Centers™ website (Program Tools > AAM File Center™). Designed to make important information accessible with just one login, AAM File Center™ is a permission-based system that shows users different content depending on who they log in as: a retailer/installer or WD employee. For example, program retailers have access to current jobber pricing (including MAP and unilateral pricing) for supported Total Truck Centers™ lines. In addition, they can look up competitive price comparisons for many program AND non-program vendors alike to help them determine the most effective pricing strategies for their own local markets. Warehouse distribution users can access that same pricing information plus a host of other important data such as member contracts, vendor policies and data forms, price sheets, the buyer’s calendar, and more. To view the system at any level, you must have an Insight™ account. 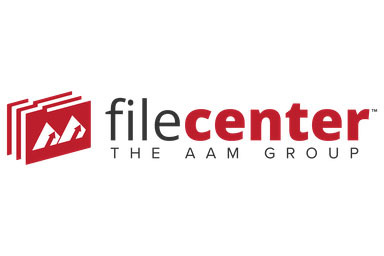 Just log in and look for the AAM File Center™ (DMS) module. 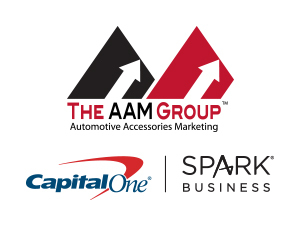 If you aren’t yet registered, go to accounts.theaamgroup.com and register (it’s free!). Once approved, you’ll receive your log-in credentials via email. AAM File Center™ is a custom tool built just for Total Truck Centers™ jobbers and warehouse distributors. It can be accessed through the Insight™ account system or the Total Truck Centers™ website (Program Tools &gt; AAM File Center™). One of the best examples of modern technology revolutionizing an industry can be found with automotive auxiliary lighting. Sophisticated LED technology, advanced optics designs, and modern manufacturing techniques have created lighting that is brighter and projects farther than anything imagined just 10 years ago, all while consuming a small fraction of the power compared to traditional incandescent lighting. 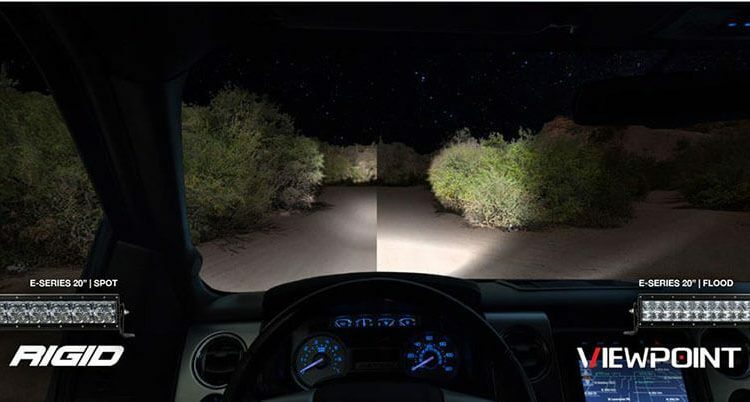 RIGID was a pioneer in bringing modern LED technology to the off-road world, and the company remains a leader in the industry today with continuous advancements and a steady stream of new products that are all geared toward lighting up the night. But the company’s rapid advancements in technology and ever-expanding product lines have created a challenge for the consumer when it comes to choosing the best lighting solution for an individual need. Single- or double-row light bars? Cubes and pods with four LEDs or six? Or eight? Spot, flood, combo, or diffused optics? These are just a few examples of questions that a consumer must answer before they can pick the perfect lighting products for their uses, and it’s even more challenging when most RIGID products are available with a variety of configurations in a single fixture. With so many choices, it can all be a bit overwhelming. Recognizing the challenges that a consumer faces when trying to make an educated buying decision, RIGID has introduced a game-changing new tool that enables consumers to see exactly how the company’s different lighting products will perform, and even compare different types of optics in the same fixture right from a computer screen. Called ViewPoint, this sophisticated software is far more than an approximation of how a light will look or a photographic example of an individual lighting configuration. Instead, the proprietary tool uses scientific data to create a realistic view of how every RIGID light performs in each of its configurations. The user can toggle among different optics in the same light, compare them side by side, and even combine different products. ViewPoint starts with the beam analysis of each light on a goniophotometer. This sophisticated light-measuring instrument analyzes the light from all angles, and the data gathered is used to create an IES file. “IES” stands for the “Illuminating Engineering Society,” an internationally recognized group dedicated to improving the lighting industry. But that’s not their only role: much like the Society of Automotive Engineers (SAE) in the automotive world, they establish uniform test criteria and standards that virtually everyone in the industry uses to analyze the output and color temperature of a lighting fixture. An IES file is a 3D model of the beam of light coming out of any fixture. This same data is also the basis for the lux diagrams that are commonly seen on RIGID’s website and in the catalog. The takeaway is that IES files are scientific data that don’t lie; indeed, they represent the true output of a light measured by standardized procedures. RIGID ViewPoint takes the data from the IES files and uses custom software to create a more realistic representation of a light’s output than one would see on a one-dimensional lux graph. Because the software is extracting data directly from the IES files, it is able to create a highly accurate representation of how the light will appear in real life. And because the data is so accurate, differences in optics and beam patterns, for example, become striking. 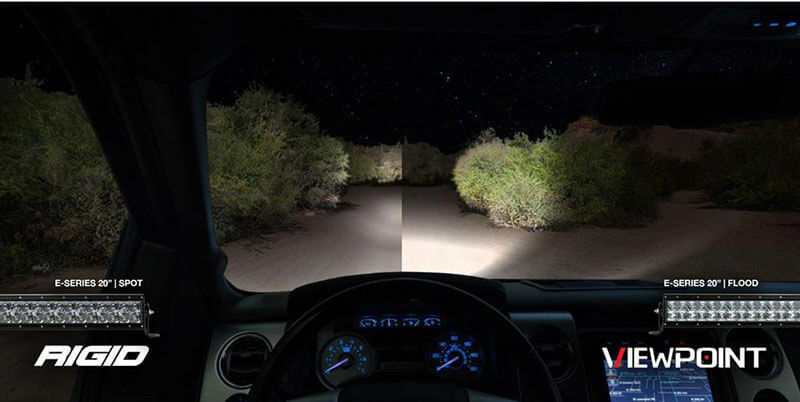 Using RIGID ViewPoint, it’s easy to understand the differences between optics, sizes, and shapes, as well as how those differences will affect the amount of light and distance that is projected from the vehicle. Because the software’s data is scientifically gathered and measured using standardized means, ViewPoint can create highly accurate examples of different light outputs, complete with how they illuminate objects in the foreground, middle distance, and far away. Being able to see a realistic output of any specific light is impressive, but the software offers several extra features as well. 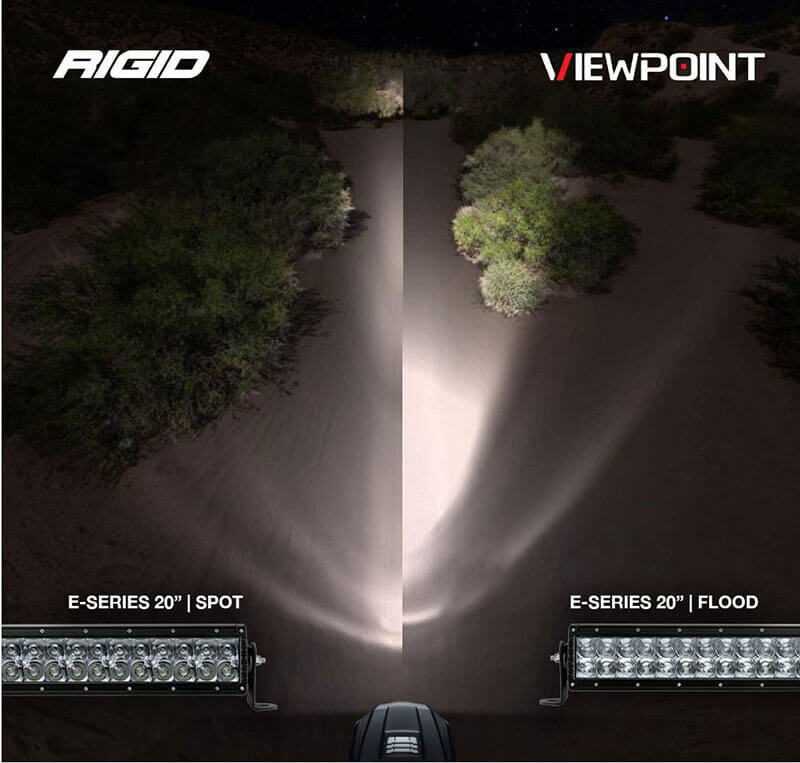 Users can compare different optics in the same RIGID product side by side via the split-screen function; combine any two lights in RIGID’s product line to see how they would perform together; and even manipulate the view from the vehicle hood to behind the wheel. There’s even an overhead view (that looks surprisingly like a lux diagram!). Quality LED lighting represents a substantial investment, so it’s important for buyers to understand the differences in optics, outputs, and configurations in order to make the best lighting choices for their specific needs. Before RIGID ViewPoint, that meant finding someone with the light you were considering in order to see it in person, or perhaps seeing a live product in a showroom that may or may not be functional. With this software, consumers can now see exactly how RIGID lights perform in a highly realistic virtual world, and even how two of the company’s products can work together. While it’s a powerful sales tool, its primary purpose is to be informative so that consumers can make educated buying decisions. It’s another industry first, and one that helps to ensure that RIGID stays at the forefront of the auxiliary off-road lighting market. Check it out for yourself at rigidindustries.com/viewpoint. <p>Ready to see the light?